We manufacture Cold Rooms for Horticulture.For the horticulture industry cold rooms are also designed for definite temperature and humidity levels that maintain freshness of the product. High humidity evaporators play an important role in most of these cold rooms. When the flowers are stored, the airflow is controlled so that the flower petals are not affected. 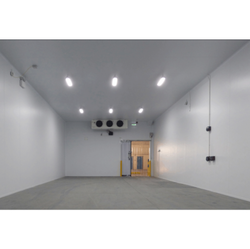 These cold rooms are designed to direct the airflow away from the product and are low and also avoid turbulence. We manufacture and supply Cold Rooms for Hospitals that find extensive application in hospitals and research labs for storing blood sample, diagnostic kits, life-saving drugs and serum samples. 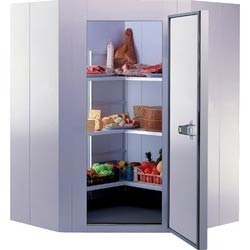 We are the manufacturers and suppliers of cold rooms. We also manufacture Cold Rooms for Dairy.On maintaining accurate temperatures the diary and ice-cream sector completely relies on cold rooms for dairy and ice cream. Keeping in mind the daily necessities, we design the cold rooms with multiple units that ensures uniformity in the level of temperature. Apart we also fabricate cold rooms for ice-cream factories that pull down core temperatures quickly to enable ice-cream hardening. 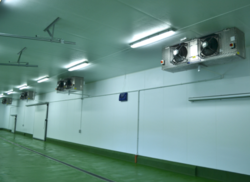 The cold rooms for dairy and ice cream sectors are also used for storage at distribution points that are uniquely designed to maintain low temperatures and consume low power. We manufacture Cold Rooms for Flori-Culture Segment for the floriculture industry cold rooms are also designed for definite temperature and humidity levels that maintain freshness of the product. High humidity evaporators play an important role in most of these cold rooms. When the flowers are stored, the airflow is controlled so that the flower petals are not affected. 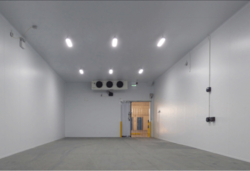 These cold rooms are designed to direct the airflow away from the product and are low and also avoid turbulence. 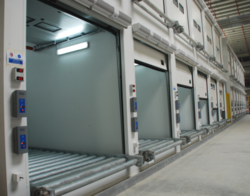 We also manufacture Cold Rooms for Seafood Industry that are extensively used in seafood industry. These are designed with the conformation to the norms of marine product export. The cooling requirement varies in the sea food industry because here the products are stored at different stages of production. 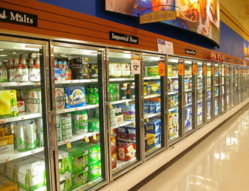 Fresh catches are stored in chill rooms which are required to pull down the temperature quickly, while processed foods required cold storage maintenance conditions. We are the manufacturers and suppliers of Cold Rooms for Restaurants. Due to ordinary challenges faces for Hotel and restaurants like heavy usage as well as constant opening and closing of the cold room. National Refrigeration designs the circuits in these hotel cold rooms in a way that maintain low temperatures even in such conditions. The door, hinges and the handle of the hotel cold rooms are designed using qualitative raw material ensuring durability even in open and close situation. The kick plates, view windows and the auto-door close mechanisms maintain the food quality by controlling the content.